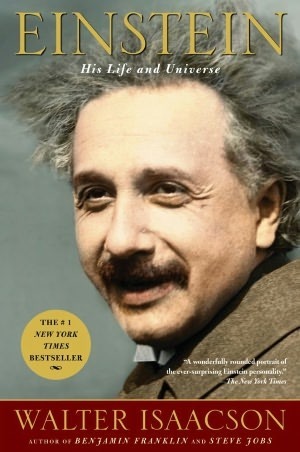 Einstein: His Life and Universe by Walter Isaacson. New York: Simon & Schuster, 2007. xxii, 675 pp. Walter Isaacson is president and CEO of the Aspen Institute. Earlier he was president and CEO of CNN and managing editor of Time. He is the author of numerous books including biographies of Benjamin Franklin, Henry Kissinger, and Steve Jobs. “Einstein, however, was not truly a relativist, even though that is how he is interpreted by many … Beneath all of his theories, including relativity, was a quest for invariants, certainties, and absolutes. There was a harmonious reality underlying the laws of the universe, Einstein felt, and the goal of science was to discover it,” p. 3. Yet the nature of his work is extremely complex, and attempting the task of explaining it in lay language is daunting indeed. Einstein himself had to deal with this all of his life. He had quickly became a cultlike figure and would frequently encounter the press who came to his lectures. Einstein had a goal of establishing the Hebrew University in Jerusalem, but reporters wanted a simple understanding of his theories. “… the reporters were more interested in relativity, and the first questioner requested a one-sentence description of the theory, a request that Einstein would face at almost every stop on his trip. ‘All my life I have been trying to get it into one book,’ he replied, ‘and he wants me to get it into one sentence!’ Pressed to try, he provided a simple overview: ‘It is a theory of space and time as far as physics is concerned, which leads to a theory of gravitation.’” p. 293. Einstein had difficulty with rote memorization, he thrived on areas of study that enabled him to use his imagination, and he worked primarily alone in areas where he could exert his nonconformist tendencies. Isaacson does a remarkable job in weaving together the personal, the technical, and the cultural influences that affected this remarkable man. The book offers fascinating insight into his life, and into the life of the scientific community. I was directed to this book after reading Isaacson’s biography on Steve Jobs, which I reviewed earlier. I was not disappointed. There are technical parts of this book that are tough sledding. I am trained in mathematics, but not in physics, and found some of the technical material very challenging. Even with a high-level understanding, readers may find it difficult from this writing to link the basic scientific work that he did to the modern work on photo cells, lasers, semi-conductors, fiber optics, and space travel. But in spite of this gap, it is possible to grasp the broad contours of the subject from this well-written book, and to gain insight on one of the profound figures of our time.